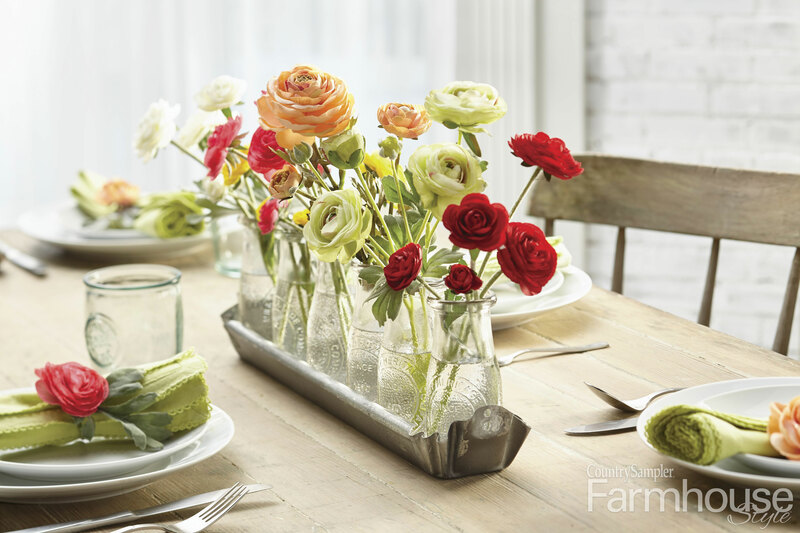 Farmhouse Floral Arrangements—How Creative Can You Get? 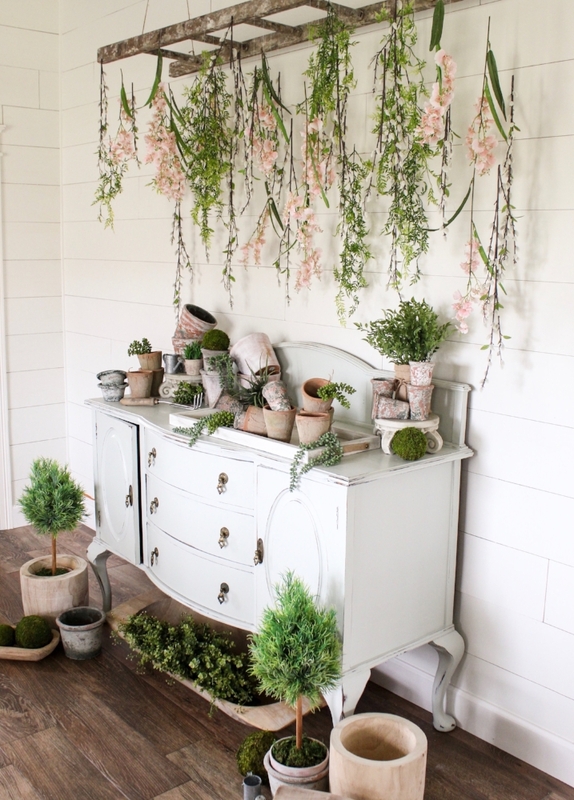 Home / Farmhouse Style / Decorating / Farmhouse Floral Arrangements—How Creative Can You Get? Ah… springtime. When birds start twittering outside my window again, robins start plucking fat worms from the ground, buds start sprouting from the trees and my tulips begin pushing their way up through the dirt. One of the things I love about spring is all the fresh flowers. Wait, who am I kidding? I love fresh flowers all year round! But there’s something about bright colorful bulbs nodding toward the sunlight, or bunches of wildflowers spilling out of a vase, or a handful of sweet-scented lilacs cut right from the bush that make me truly think of spring. I have a variety of vases in the house, but this year I wanted to try something a little different. So I’ve been gathering ideas from our past issues as well as some of my favorite farmhouse-style bloggers. And it’s made me realize two things. 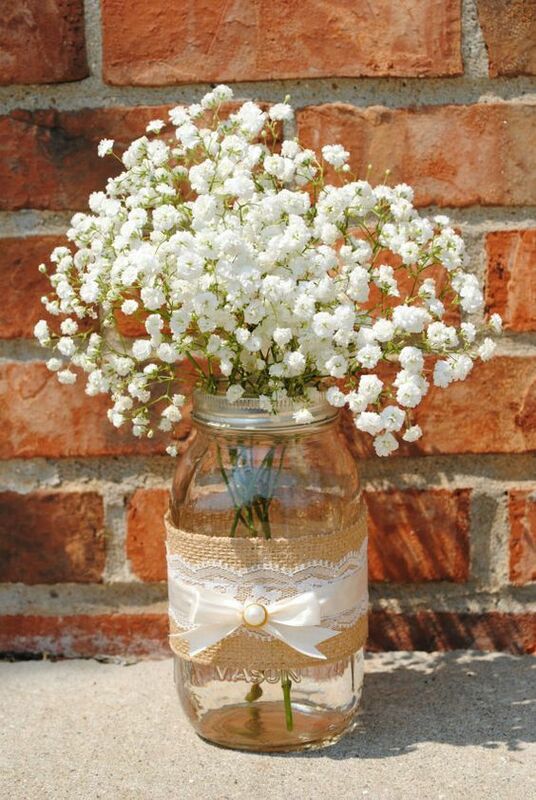 First, farmhouse lovers are so creative when it comes to arranging flowers in beautiful simple ways. And two, almost anything can hold a floral arrangement! In fact, the more interesting the container, usually the more striking the display. With the use of floral foam, plastic inserts, water tubes, and homemade florist frogs, you can turn almost anything into a flower holder. A cheery display from one of our past issues. One of my favorite ideas, which I’m going to try out with the purple lilacs from my backyard, came from the cover of one of our Summer Decorating issues a few years ago. Our designer simply took a summer bonnet, inserted a plastic liner stuffed with floral foam and stuck stems of colorful blooms into the foam. She tied a bow around the hat and placed it on an old wooden chair. The effect is so cheery and spring feeling! Hang a flower-filled tote bag from a hook for instant farmhouse-style charm in an entryway. 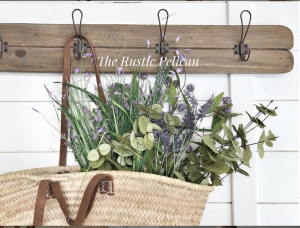 Photo from The Rustic Pelican. several stems of grasses and tiny purple flowers in a straw tote hanging from a hook. What a great idea for a front entryway! Another idea I really want to try is using something old or a piece intended for a different purpose in an unexpected way. Our designer Nancy Borsodi has created several floral arrangements through the years. Two of my favorites are some of the simplest in design: a collection of small milk bottles lined up in a metal chicken feeder tray and old bed springs coiled around test tubes. Both arrangements use just a few stems in each container, but the overall look is simply charming. 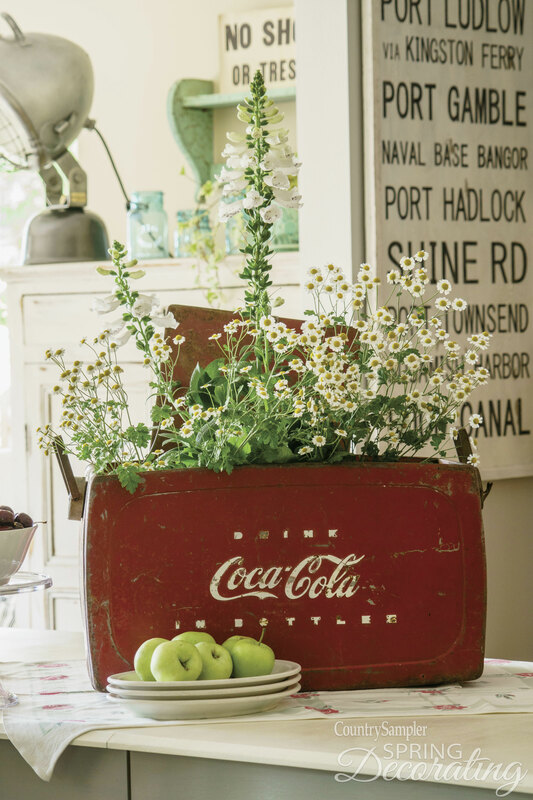 In one of the homes we featured in a past issue, the homeowner, Amy Chipman, filled an old metal Coca-Cola chest with white daisies, which made a large wonderful display on the center of the table. Elsewhere in Amy’s home, a small potted plant got tucked into an old metal mailbox. What cute ideas! A vintage Coca-Cola cooler becomes a striking centerpiece. Photo by BlackstoneEdge.com; from Country Sampler Spring Decorating. 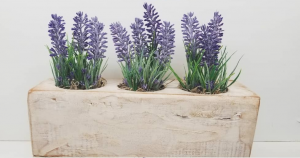 At Rustique Charm by Leese, this Etsy shop owner features a wooden sugar mold that serves as a planter for lavender (granted faux lavender, but you could do something similar with real plants). And at My Crafty Spot, sunny yellow tulips planted right into a vintage wooden tool caddy look oh so springy! 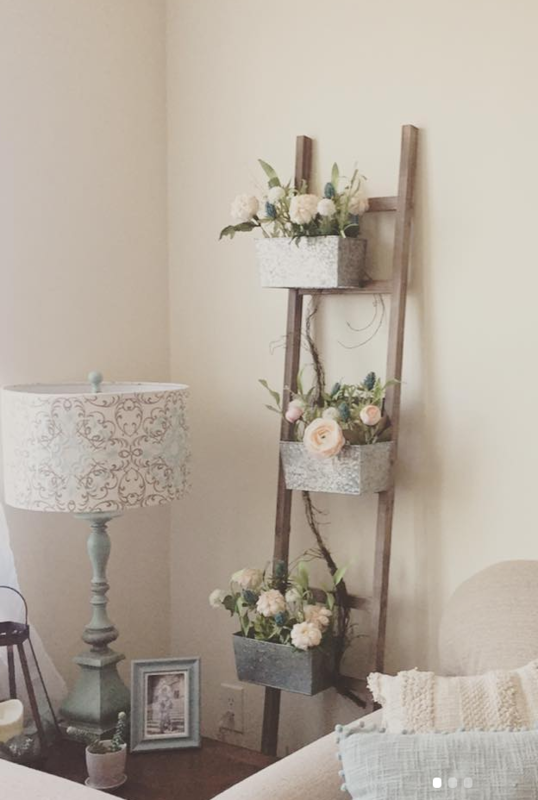 I even found two ways to incorporate ladders into floral arrangements. Lauren DeNoble redid a corner of her living room, hanging small metal planter boxes from the rungs of a ladder propped against the wall. And at Cotton Stem, a ladder hung from the ceiling creates an almost chandelier effect with blooms hanging upside down from the structure. Wow! Strips of burlap add instant farmhouse-style charm to a mason jar. Photo from Weddingomania. Now hanging a ladder from the ceiling goes a bit beyond just an easy floral arrangement, but there are still things you can do to liven up simple pieces. 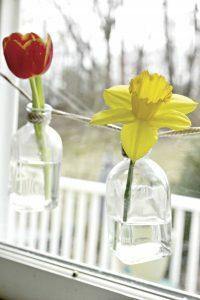 At Golden Boys & Me, Courtney strung small glass bottles between her window and inserted single blooming stems in each bottle for a living garland. Another beautiful-in-no-time idea is to simply wrap strips of burlap or lace around mason jars for instant romantic rustic vases, like those shown at the wedding site, Weddingomania. 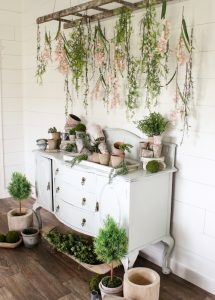 So as you can see, there are almost endless ideas available for creative and unique farmhouse-style floral arrangements. 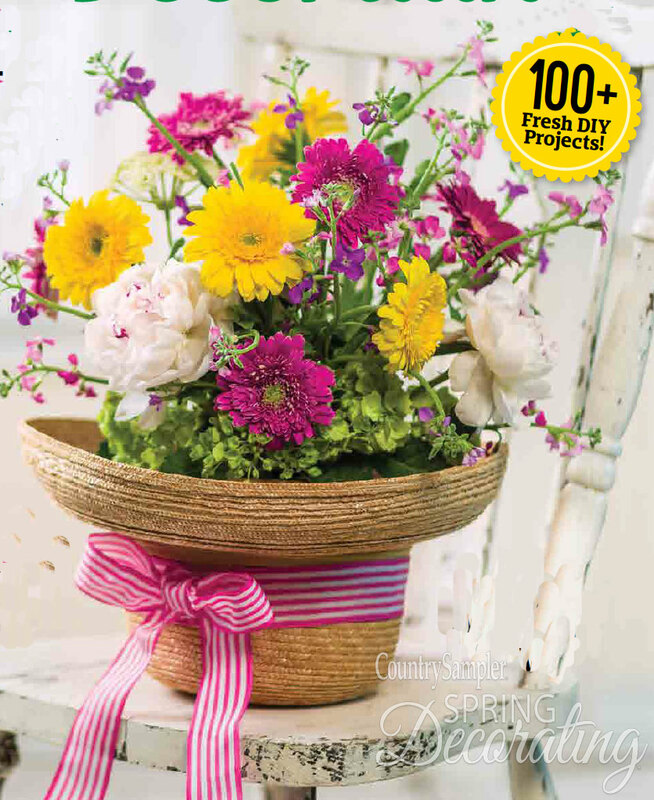 Give yourself a springtime boost this week and purchase a pick-me-up bouquet (or cut one yourself if you’re lucky enough to have flowers blooming already), and find a unique container to give it style. And if you do create such a display, share it in the Comments below. We’d love to hear about everyone’s creative ideas! Simple vases strung across a window make a living garland. Photo from Golden Boys & Me. 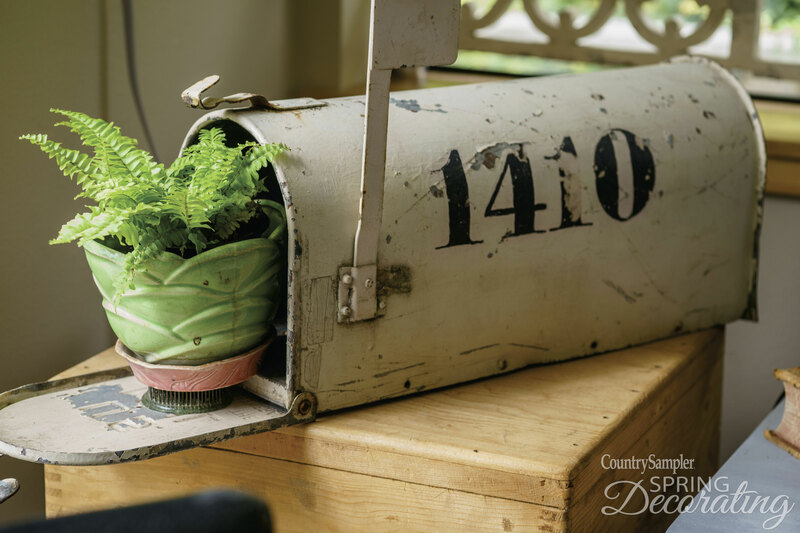 A mailbox becomes a hidden spot for a potted fern. Photo by BlackstoneEdge.com from Country Sampler Spring Decorating. Faux lavender looks lovely in this wooden sugar mold from Rustique Charm by Leese. This ladder display is truly unique! Photo from Cotton Stem. 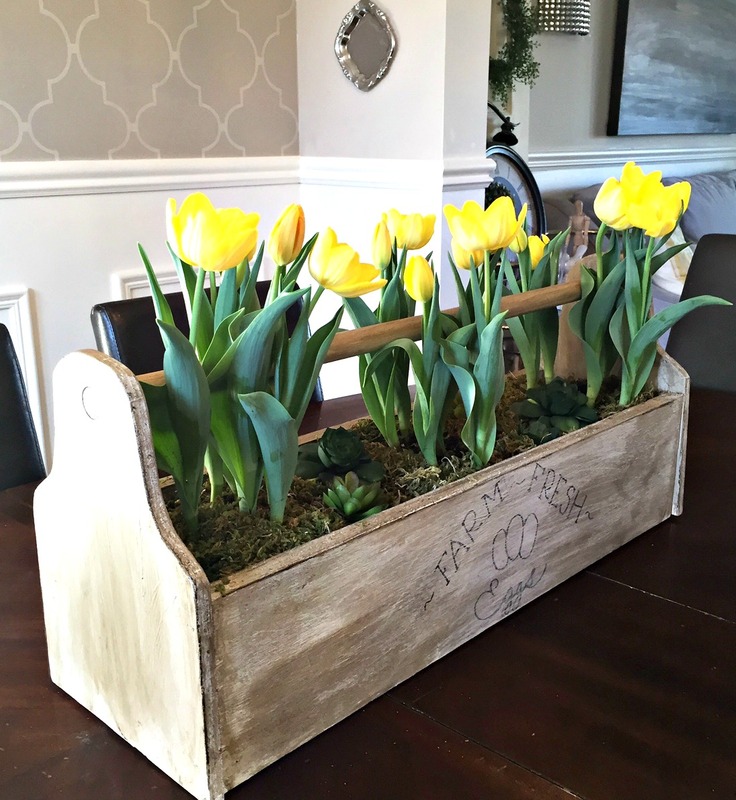 Rather than just using a wooden tool box as a display piece, turn it into an actual planter. Photo from My Crafty Spot. Milk bottles lined up in a galvanized chicken feeder tray makes an adorable farmhouse-style floral arrangement. Photo from Country Sampler Spring Decorating. 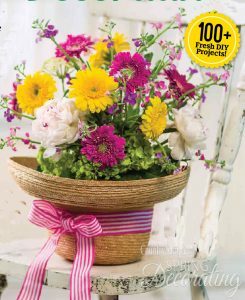 Flower-filled metal baskets are perfect to hang on the rungs of a ladder propped against the wall. Photo from DeNoble Home. How cool is this? 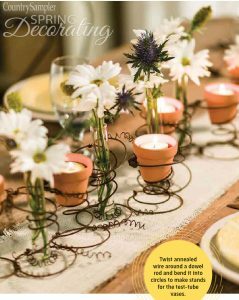 Old bedsprings coil around test tubes for a farmhouse-style arrangement. Photo from Country Sampler Summer Decorating. 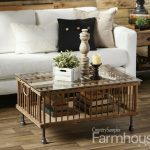 ‘Farmhouse is Not Just All White’—Which Farmhouse Style is for You?